Sculptor Giacomo Manzù was born Giacomo Manzoni on this day in 1908 in Bergamo in Lombardy. The son of a shoemaker, he taught himself to be a sculptor, helped only by a few evening classes in art, and went on to achieve international acclaim. Manzoni changed his name to Manzù and started working in wood while he was doing his military service in the Veneto in 1928. But he achieved national recognition after he exhibited a series of busts at the Triennale di Milano. The following year he held a personal exhibition with the painter, Aligi Sassu, with whom he shared a studio. 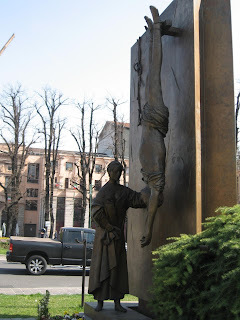 He attracted controversy in 1942 when a series of bronze bas reliefs about the death of Christ were exhibited in Rome. They were criticised by the Fascist Government after they were interpreted as an indictment of Nazi-Fascist violence and Manzù had to go into hiding for a while, fearful of arrest. He then moved to Salzburg, where he met his wife, Inge Schabel, who became the model for several of his sculptures. One of his most striking works is his Monument to the Partisan, which he completed in 1977 and gave to his home city of Bergamo as a gift. He built an 11-foot high sculpture, Passo di Danza, in Detroit and his last great work was a six-metre tall sculpture in New York in 1989, representing a woman holding a child. A devout Catholic, Manzù was a personal friend of Pope John XXIII, who was also from Bergamo, and he completed some important commissions for the Vatican and St Peter’s Basilica. While in Rome he lived in Ardea, south of the capital and close to the sea, in a locality that has since been renamed Colle Manzù in his honour. Ardea has a museum dedicated to his work. His son, Pio, was a car designer who is credited with the design for the groundbreaking Fiat 127, the 'people's car' of the 1970s, although he never saw the project completed. Pio died tragically young in a road accident at the age of just 30 in 1969. 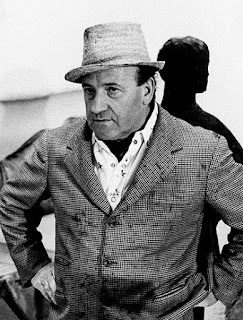 Manzù died in Ardea in 1991. The New York Times described him in an obituary as ‘one of Italy’s leading sculptors whose work often mixed religious, allegorical and sexual imagery’. Bergamo in Lombardy, where Giacomo Manzù was born, is a fascinating, historic city with two distinct centres. The Città Alta, upper town, is a beautiful, walled city with buildings that date back to medieval times. The elegant Città Bassa, lower town, still has some buildings that date back to the 15th century, but more imposing and elaborate architecture was added in the 19th and early 20th centuries. 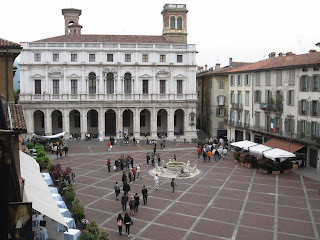 Piazza Matteotti, in the Città Bassa in Bergamo, is the site of Manzù’s remarkable work, Monument to the Partisan, which the sculptor dedicated to the Italian partisans who fought against the Germans to liberate their country during the Second World War.